Recently we've been improving WMSPanel reporting capabilities with features that would be useful for billing purposes. Daily Stats functionality shows several important numbers that are often used for charging clients. 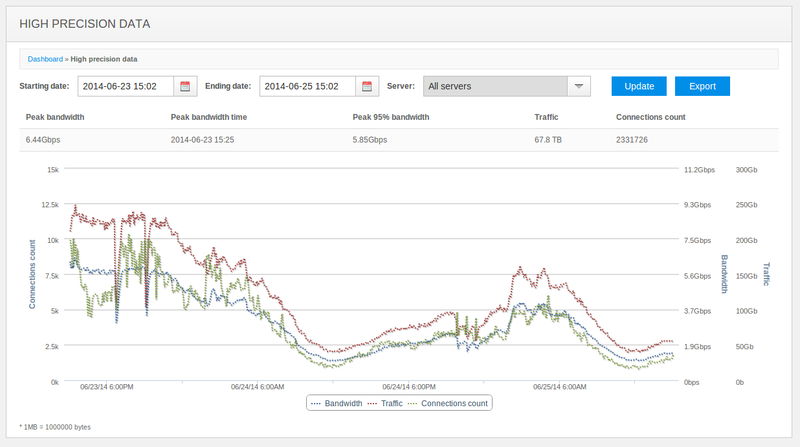 Those are views count, peak bandwidth and traffic. There is also total duration counted for each day. They are all combined and calculated using 30-seconds sync-ups which a server gives to our front-end. Even though we get and process these numbers on a high-frequency basis, industry standards often require other calculations. A lot of companies prefer 5 minutes interval for calculations. Chart information is shown with 5 minutes intervals. If a visitor started watching at 13:59 and finished watching at 14:11, his connection will be added to total number of connections in 14:10 bucket. His traffic, however, will be spread among 4 intervals: 13:55, 14:00. 14:05 and 14:10. So last night live football streaming will be measured precisely by the time of the game, with ability to get number of people watching game periods and advertising. We added those 4 new calculated numbers in addition to existing combined reports and high-detailed reports. High precision report: peak and 95% bandwidth, traffic and connections. Recently we've had a raise of interest to one of our unique features. I'm talking about branded panel. What makes it so special? As you know, WMSPanel front-end is a web-site available at wmspanel.com domain. So when a customer creates an account, he goes there, adds servers and starts watching our nice charts and detailed reports. Say, it would be imaginary Ultimate Media Streaming Co., Ltd (or just UMS) located at imaginary www.ultimatemediastreaming.com. When this customer wants to show the charts or the numbers to respective clients, he creates data slices which allow him to separate clients' data and reports. After that he's supposed to give his clients new credentials and forward them to wmspanel.com, which becomes a third-party for both UMS and its client. This is where branded panel comes in. WMSPanel can camouflage itself into a customer's control panel. It's also commonly known as a white label. So you give new URL to your customers and the panel will look they way you want. 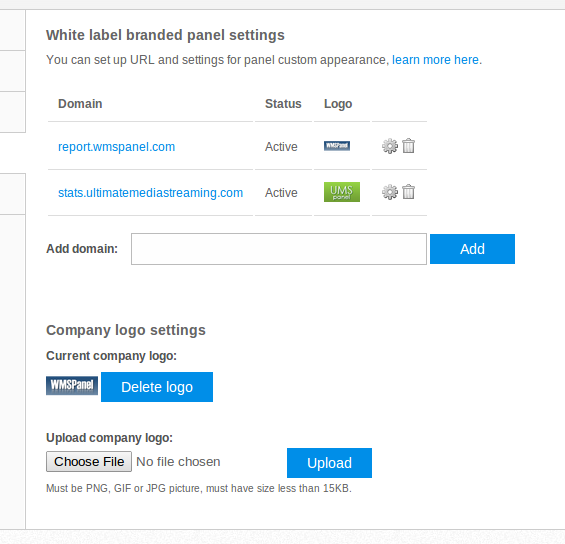 Moreover, you can set up any number of branded domains and each will have its own logo as well. So each of the data slices may have its domain for reporting. Customer prepares their company logo. PNG with transparent or black background, having 112*40 pixels or proportional size, is the best option for that. Now customer admin goes to the panel Settings -> Branding menu. There he adds the new mapped domain he'd like to map his panel to. He also uploads company logo which was prepared earlier. In addition he may set up a custom CSS to make the white label panel look exactly the same as the main website to make perfect user experience. Settings up white label domains and logos. Selecting logo to chosen domain. 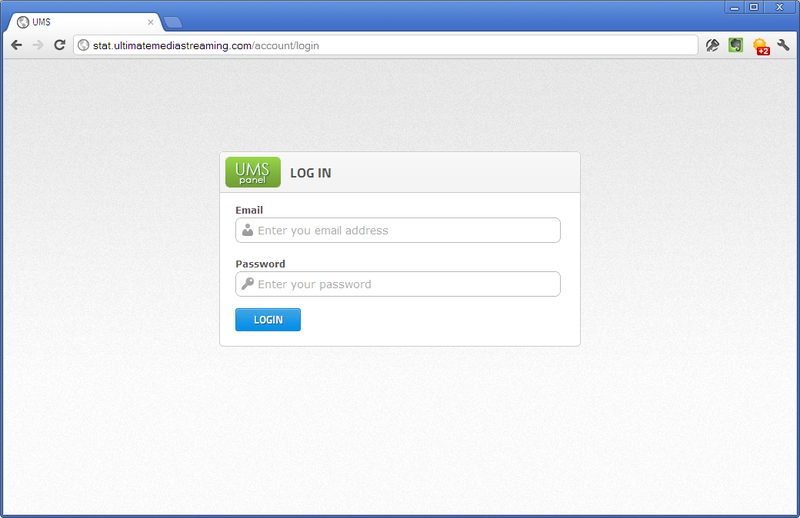 After that UMS representative may provide stat.ultimatemediastreaming.com link and user credentials to any client created with company's data slices. OK, so as you see from the screenshot below, a user sees company logo browsing company's domain. So this looks like the same old place, and his streaming provider just gave him some nice new control panel to track his assets. No mentions of any third-parties, just our customer and the client. Panel branding comes free of charge. We also plan adding custom favicon.ico and external CSS support to make it look and feel like your own website. As you may have noticed, WMSPanel works via HTTPS protocol, but branded panel doesn't. We cannot expand the certificate to any other domains besides wmspanel.com thus we just avoid it for customer domain. You can set up white label via SSL by yourself, read this blog post for details. So if you've already signed up at WMSPanel and are ready to use the branding, please contact us for further actions. If you haven't tried our solution yet, do it today. Read more about slice-related features in on the dedicated Slices & Branding page. WMSPanel provides duration reports for supported media servers as part of Daily Stats reporting. Here's a overall description of this feature. Wowza time and duration report. First, it shows total play time and average play time. Check out "Play time" column on a snapshot below. 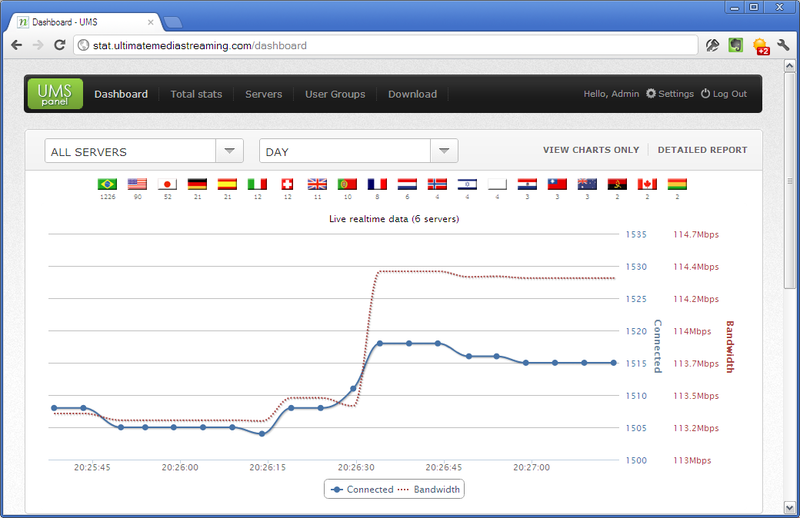 We've launched a new type of reports for media servers customers, we call it "Daily Stats". They show data collected into 24-hours buckets. Each data slice now has its daily granulated statistics. Each day includes a chart and a raw data table. Basic metrics on a common chart.